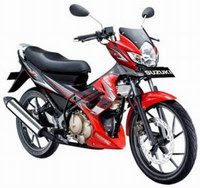 Harga Motor Suzuki Satria here is the average price of the Big City Like: Jakarta, Bandung, Medan, Surabaya, Semarang, Makassar, Denpasar from various stores and authorized Dealers. Changes made by Suzuki Satria FU is replacing the headlights and fairing model (hood), the instrument panel (speedometer design), exhaust tip, aluminum frame, and the stirrup or holding back of the motor. Now this Duck Super Sport Motor Suzuki Satria FU is equipped with two choices riding model called the Suzuki S-DMS (Suzuki Drive Mode Switch), which is “eco” and “power”. Mode button is placed on the right side instrument panel and easy access to the driver while driving. Suzuki Satria FU 150 technology with 147cc engine, 4 tak, DOHC 4 valves, water Cooled with SACS (with Suzuki Advanced Cooling System). FU150 is most big motorcycle compared to other ducks.